Note: You can enter this giveaway two (2) times per e-mail address per day. Deadline is 11:59PM ET 6.14.19. Whether it’s potlucks or parties, birthdays or a big game, the 14-Piece Bake, Serve & Store Set by OXO has you covered. The set is crafted from durable glass that can withstand extreme temperature changes and go from freezer to oven to table with ease – perfect for serving Fruit Crumble or S’mores Brownies. Included are a 9 x 13″ Baking Dish with Lid, Glass 8 x 8″ Baking Dish with Lid, Glass Loaf Pan, Glass Pie Plate, 1 Cup Round Container, two 2-Cup Round Containers, and 4-Cup Round Containers. 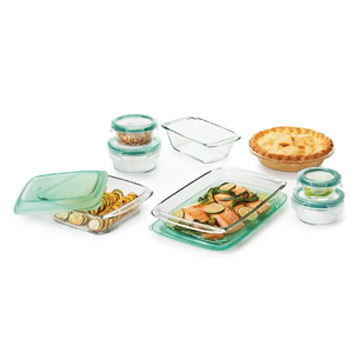 The baking dish lids are slosh-proof to prevent spilling when on the go and the SNAP containers are leakproof to keep foods fresh and any liquid inside. NO PURCHASE NECESSARY TO ENTER OR WIN. Void where prohibited by law. Open to legal residents of the 50 U.S., D.C. and Canada (excluding Quebec) who are at least eighteen years old at the time of entry and have internet access. Begins on 4.19.19 at 12:00:00 a.m. ET and ends on 6.14.19 at 11:59:59 p.m. ET. To enter the giveaway, submit your full name and email address on this form. Odds of winning this giveaway depend on the total number of eligible entries received. Only two (2) entries per email address per day. Sponsored by Leite’s Culinaria, Inc. For more information, visit our Official Rules. Be sure to add giveaways@leitesculinaria.com to ensure notification if you are the winner.